I believe a lot of people have heard, seen and owned this highlighter from The Balm by now, kan? kan? Actually it's insane how I dragged for a year passing by SASA outlets, swatching the highlighter on the back of my hand and just admiring it without really getting one for my own use. I think it's simple because I wasn't keen with the price! I'd consider everything expensive when the price is above RM50. ;P Anyhow, because of so many positive reviews, I gave it and bought it. I've been using the highlighter for more than 3 months now and it's time for a review. I'd say theBalm Mary-Lou Manizer is a gorgeous shimmery gold-champange highlighter. When I say gorgeous, I REALLY mean it. It's beautiful. It's stunning. You can insert any suitable emojis here to convey my excitement. Ha. I mainly used this to highlight my face - cheekbones, down the bridge of my nose, below the brows, inner conner of my eyes, chin, and cupid bow. A.K.A, the entire face! (almost, lol). It can also be double as an eyeshadow. The packaging of the highlighter featured a Marilyn look-alike lady named Mary-Lou with a prison theme going on. Sesukehati aku je nak cakap tu serupa Marilyn Monroe eh, but anyhow, I love how theBalm adding humour element to their packaging! talk about marketing strategy!! The highlighter itself comes with a big round mirror, in which I always prefer. It's easy to open and it close satisfyingly. The texture of the highlighter is smooth, not patchy and it's like being pressed well on the pan. It is to my liking since that could also mean I wouldn't get a lot of fall out. On my face, it will give the nicest glow, not too shimmery or glittery. Just fine, it quickly makes me think no wonder people have been raving about this highlighter. Longevity - I'd say throughout the day. Eh bohong, hampir lah. Hampir. Close enough. I don't find myself re-touching it throughout the day. Hmm, oh wait, I didn't bring my highlighter whenever I go out, Lol. Favourite method to apply? Real Techniques Contour Brush but it simply because I don't have any other suitable brushes. Small packed bristles would give you more pigmented effect but the shadow itself is extremely pigmented. Best to apply lightly as I find that makeup to be easily overdone by this unless you purposely wanting your makeup to look wet. 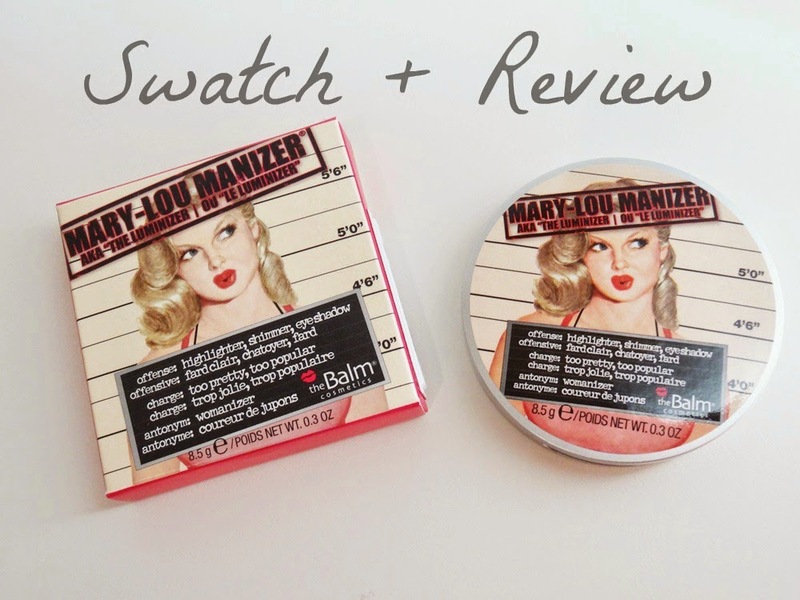 Name : Mary-Lou Manizer AKA "the Luminizer"
As theBalm itself sits between high end - drugstore brands, the price may be steep for some (read, me) but hey, this one's gonna last you for lifetime. It's a nice added bonus if you plan to buy this during sale season though the price different isn't that much =/. I don't think I will ever finish this, I certainly won't ever need to repurchase! Hehe, but babessss, you need to own it if you haven't already! I've heard really good things about this highlighter but I haven't tried it yet. I usually use liquid highlighters, but this is such a pretty color! Mine is nothing compares to yours ;P ;P hehe. A bit pricey but I think It looks okay. Izit ? A bit pricey but I think it looks ok.
Agree that this highlighter is a bit pricey, almost RM100 kan. But I think it's a great investment. Arghhh! I wonder when I am gonna pick this up, it is sublime!! !